After 6th CPC,the employees who are granted Rs.4200/- Grade Pay have been classified as Group ‘B’ Industrial and Non-Gazetted by DOP&T. Though these categories of employees have been appointed by the Sr. General Managers/General Managers of Heads of the establishments but disciplinary powers in respect of Group ‘B’and ‘C’ Civil posts have been authorised to Chairman OFB. The issue of delegation of powers to Sr.GM/GM of the respective factoris was discussed in JCM III and the same was taken up by OFB to MoD and DOP&T. 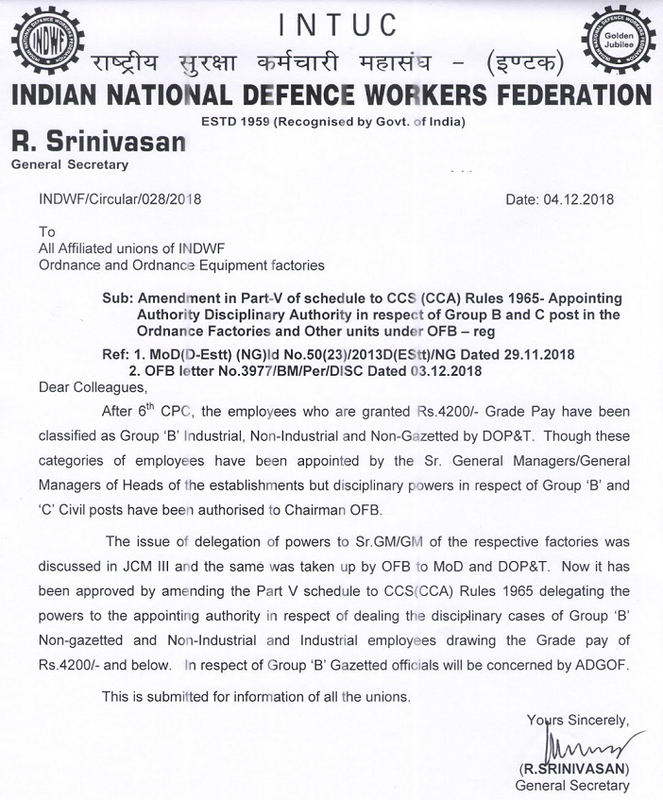 Now it has been approved by amending the Part V schedule to CCS(CCA) Rules 1995 delegating the powers to the appointing authority in respect of dealing the disciplinary cases of Group ‘B’ Non-gazetted and Non-Industrial and Industrial employes drawing the Grade pay of Rs.4200/-and below. In respect of Group ‘B’ Gazetted officials will be concened by ADCOF. This is submited for information of all the unions.